Have you wondered about SOLIDWORKS User Groups and how you can get involved in one close to you? This Q&A features James Adkins, Computer Aided Drafting department head at Almanac Community College and group leader for the BACoN SWUG. 1. When you started using CAD software in your classroom in 2014, what made you choose to use SOLIDWORKS instead of another CAD program? My introduction to SOLIDWORKS began out of necessity to support my students. While I did not teach SOLIDWORKS, my students were taking a class in it and asked me questions about their projects. I realized I would be a more effective educator if I were better able to assist them and provide more thorough answers. Up to that point, all of my solid modeling had been done in AutoCad 3D. Once I started using SOLIDWORKS, there was no looking back. 2. 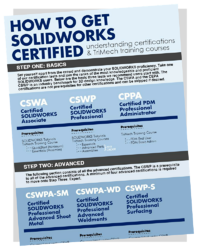 Is SOLIDWORKS the only CAD software taught at ACC? At Alamance Community College, we teach two semesters of AutoCad and then three semesters of SOLIDWORKS. Once introduced to it, students will take six classes, which include SOLIDWORKS as a required design tool. This includes Fluid Mechanics (Flow), Machine Design (Simulation), Mechanics (FEA) and Design projects (Assemblies and 3D printing). 3. What are your roles/responsibilities in your local SWUG? My role is the Burlington-Alamance County NC SWUG (BACoN SWUG) group leader. As this is a new group, I do not yet have a co-leader which means that I do it all. I presently plan all meetings, schedule locations, meals, presentations, recruit new members and work with the sponsors to build the support of our group. It all makes for a very busy evening at home, but it is worth the effort. 4. How did you become involved in the SWUG? I created the group after learning how many SOLIDWORKS users in the area didn’t participate in any groups. After successfully connecting with local businesses that use the software, I now have 55 users on my mailing list. I plan to hold eight to ten meetings annually, so all members have ample opportunities to attend at least six meetings in a year. One of the best parts with the new group thus far has been in deciding upon a name and developing the logo. I have joined an elite crew of users known as the #BACON Brotherhood (if you have never heard of these guys, make plans to attend SOLIDWORKS WORLD 2018). It seemed like a perfect fit to incorporate bacon into the new group name. While I didn’t plan to build a new user group in this area,it sort of jumped in my lap. I had met many local users who wouldn’t make the drive to other regional groups. I saw this as an opportunity to reach out to the local business community and foster a professional network for local users, including students as well as industry users. Both education and industry coming together to promote and combine new technology with professional skills which allow all members to grow and get to know each other. 5. How has being a leader in this group helped you in your career, your life and your overall growth as an engineer? BACoN SWUG is the second user group I have lead. My previous group, SoVA SWUG, in Danville Virginia, was where it all began. As a group leader, I have developed professional contacts which have brought career opportunities to my students as well as helped them begin building their own professional networks. Additionally, I have met a lot of great people at the meetings and promote my CAD program to local businesses where I am developing partnerships and personal relationships. On a personal side, I have completed a couple of certification exams with plans to sit for several others as time permits, developing training. As a leader, I have also had the opportunity to attended a couple of SOLIDWORKS World conferences and worked with professionals from all over the world. Through these conferences I have gotten to know a few SOLIDWORKS corporate directors as well as certified SOLIDWORKS experts. Not only does this provide a tremendous resource, but some of them have visited my groups as guest speakers and presenters. Many thanks to Richard Doyle, Casey Gorman and Sal Lama for their time, support and work they do for all SWUG’s. 6. How do you become a leader in a SWUG group? What steps or tips would you provide someone who is seeking to become a leader in the group? First and foremost, search for SOLIDWORK User Groups near you, and determine if there is another group within a short drive of your location. If so, find out if the group is active and possibly get involved with it. If there isn’t one nearby, you can request a group to be set up in your area. You will need to do some research to ensure there are enough local users to support the group. You can contact local VARs like TriMech, and let them know you are interested in setting up a group. While they cannot give out contact information, they can help promote the group. I searched the job want ads for jobs which required SOLIDWORKS experience and wrote to the companies announcing my group. This resulted in more than a dozen responses with new members. The SWUG site also includes general information about regional contacts who are responsible for user groups in their assigned areas. If you have questions or are looking for general information, they are great people to contact. It is also important to develop a good relationship with sponsors as they provide additional resources for the groups. TriMech has been a great sponsor for both of my user groups and has provided a lot of wonderful door prizes to each. More importantly though has been the presentation support, and TriMech's willingness to send Application Engineers to the meetings. These guys are CSWE-level users who have a willingness to share their knowledge and demonstrate their expertise in intriguing presentations, like TriMech Application Engineer Justin Lingerfelt. .
7. How does the SWUG help aid students at ACC directly? My students have gotten involved with the user group and have all seen ways that SOLIDWORKS is used in industry. They have also started developing professional contacts, which may one day result in a job opportunity for them. Many of them have also won some great door prizes at the meetings while they also are learning ways they can complete their class projects faster and more effectively. It is a win-win for the students. 8. In your opinion, are most students gaining experience in SOLIDWORKS vs. other CAD programs? You might expect me to have a biased opinion when it comes to education, but I believe that there are a lot of missed opportunities here due to other software packages being free to education. Many school systems use other programs due to the cost while some are mandated by the states to use competing products. If companies use SOLIDWORKS and they prefer employees with experience in it, they should contact their local school system and provide input to that effect. 9. What are the advantages of gaining experience in SOLIDWORKS vs. other software products? I do believe there are advantages in having SOLIDWORKS experience, if for no other reason than that the job market is looking for it. I have been tracking job ads seeking SOLIDWORKS experience as well as other competing products. There have been consistently four times more jobs available for SOLIDWORKS than other similar programs. This is within a 50-mile radius of ACC’s campus. 10. Please explain the most regarded benefits of user groups to the SOLIDWORKS community at ACC. Alamance Community College has been great to provide support for the BACoN SWUG members. They provide a meeting location which includes audio visual equipment for the presentations, saving the group a lot of money planning. Plus, the college also provides training opportunities for local companies, either as custom classes or as continuing education. ACC is the place to be for SOLIDWORKS users. We (ACC) are also able to provide certification testing for student users free of charge as well as free student licenses. Members of the user group have direct access to these classes as well as a direct access to ACC personnel who can assist them in setting up specialized training as needed. The local SOLIDWORKS community has the opportunity to participate in professional development, training and observe the latest in advanced design and 3D printing technology available. 12. In what ways do you reach out to prospective students/users in the SWUG? My recruiting efforts of students include visiting local area high schools, local maker fair events, career fairs and hosting special presentations and public demonstrations during activities which I believe will draw prospective students. As another outreach, I attend the user group meetings of the Piedmont Triad SWUG in Greensboro where Stephen Frick is the user group leader. They also meet monthly on the second Wednesday of the month where as I try to meet my group on the first Thursday of the month. For more insight on SOLIDWORKS User Groups, check out our training page for groups in your area.